Condor Continues to Demonstrate the Exceptional Regional Potential of the La India Land Package. 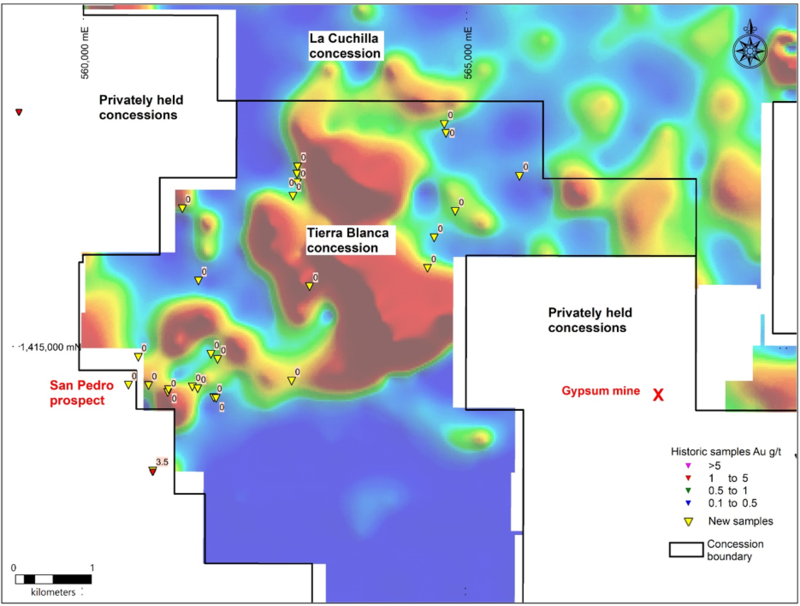 Known targets have been extended and new epithermal vein systems discovered, along with several high grade grab samples, including 99.7 grams per tonne ("g/t") gold. LONDON, UK / ACCESSWIRE / November 28, 2018 / Condor Gold (AIM: CNR; TSX: COG; OTCQX: CNDGF), is pleased to provide an update on regional exploration activity at the La India Project in the last year. The Company's strategy is twofold: 1) to prove a major Gold District of 5 million ounces ("Moz") gold and 2) to expand the mineral resources within the core area (La India, America and Mestiza vein sets) and at the satellites (Cacao, Rio Luna, Tatascame and San Lucas). Condor has also applied to the Ministry of Energy and Mines for two adjacent concessions, which will expand the La India land package from 313 km2 to 588 km2. New targets within La India and American vein sets. Re-log of 207 drill holes at La India and America was completed to help understand the shape of oreshoots and identify new ones. New wireframes have been created, and new drill targets generated. These are both down dip of known oreshoots and lateral. An exciting new target has been identified in the hanging wall of the America vein set. Cacao (about 6.0 km east of La India) is a top priority for drilling. It has the best potential to add ounces to the global resource. Mapping and drilling demonstrate it has a long strike length (> 3.0 km) and that the entire epithermal system is preserved. Drill intercepts reported in 2017 include 7.85 m @ 3.75 g/t gold, 7.85 m @ 2.95 g/t gold and 17.1 m @ 1.74 g/t gold. The vein becomes more like La India vein at depth and is as thick, or thicker. 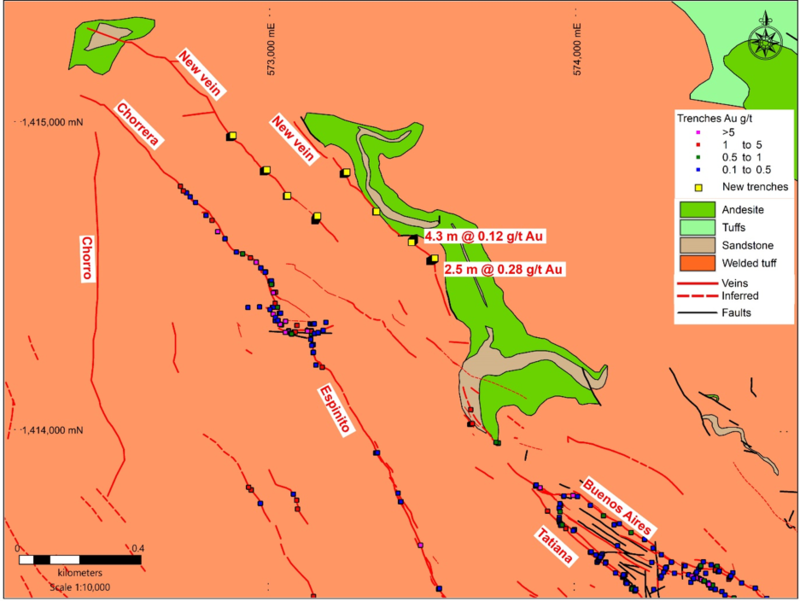 The Andrea East target (about 8.0 km north of La India) is now drill ready and shows excellent grades at surface. It is a high priority for drilling. Trenches along it demonstrate significant width and grades. Best intercepts are observed at LICT15 (4.0 m @ 1.79 g/t gold), LICT20 (5.6 m @ 1.65 g/t gold) and LICT21 (3.0 m @ 3.6 g/t gold). Grab samples give up to 9.7 g/t gold. Vein textures are very similar to La India and very encouraging. Grab samples with 24.6 g/t gold and 32 g/t gold at America (from 91 rock chip samples). Average grade of 13.4 g/t gold from 14 artisanal mines at America. One has 47.6 g/t gold. Average grade of 14.2 g/t gold from 27 artisanal mines at Mestiza. One has 99.7 g/t gold. Geological mapping and rock chip sampling have begun in the Tierra Blanca and La Cuchilla concessions. Little, or no, exploration has been done here in the past. Several silica sinters (hot spring deposits) have been discovered at Tierra Blanca. This indicates an active geothermal system and the potential for low sulphidation epithermal veins nearby. "During the past year our geologists continued the effort to prove a 5 Moz gold district. Their work is reflected in the 10 new maps in this announcement and commentary. Firstly, the relog of 207 drill holes on La India and America veins has generated entirely new open pit and underground drill targets with excellent potential to add ounces to the global resource. Secondly, new mapping and sampling on Cacao, Andrea East and the La Cuchilla concessions resulted in new drill targets. An average grade of over 13.5 g/t gold from 41 artisanal mining sites sampled by Condor on the America and Mestiza vein sets is a timely reminder that the La India Project is a high-grade gold deposit. There are so many veins in the district that the Company is effectively ‘drowning' in targets and a major issue is how to prioritise exploration. As the land package, mapping and sampling coverage grow, it allows us to understand the big picture. We can then focus on those targets with the best chance of adding ounces to the permitted mine schedule." Link to Figure 1. Map showing location of exploration areas: 1) La India, 2) America, 3) Mestiza, 4) Cacao, 5) Santa Barbara, 6) Andrea, 7) Andrea East, 8) El Derrumbado, 9) Tierra Blanca and 10) La Cuchilla. Veins shown in red. Mapping at America (Figure 2) focused on vein characterisation (texture, width and composition) and structural measurements. Increased artisanal activity has produced numerous new vein exposures. A total of 91 new rock chip samples were collected from the Guapinol, America and Constancia veins. 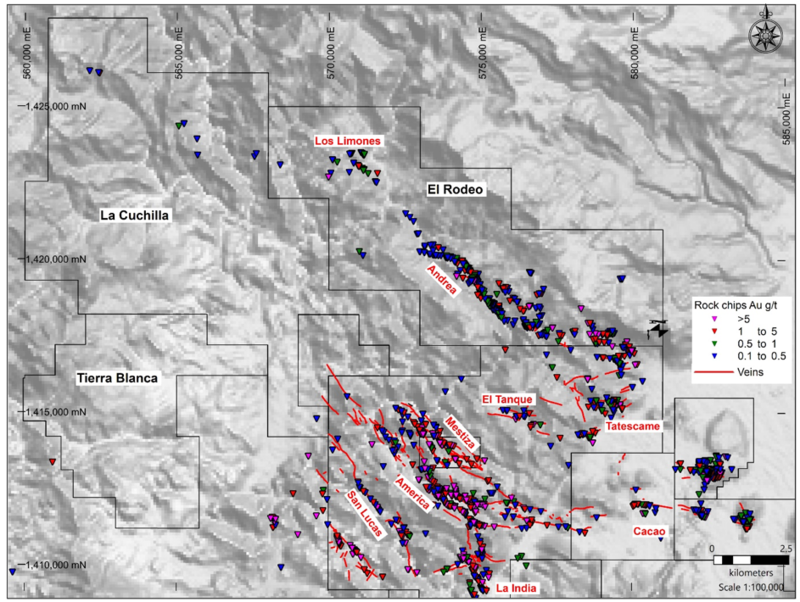 Guapinol samples tend to have the highest grades, up to 32 g/t gold. New artisanal workings in the footwall of the La India vein uncovered mineralisation. A total of 21 samples gave grades averaging 2.9 g/t gold. The Alfonso Vega vein (0.5-1 m wide) occurs a short distance into the footwall of the La India vein. It gave up to 27.2 g/t gold. Link to Figure 2. Map of America valley veins with location of new surface samples (yellow triangles) and results. After identifying an ore shoot within a bend in the Tatiana vein (‘Big Bend') during 2017 drilling, the geologic models of the America and La India veins were revised. In addition to mapping at America, core from 47 drill holes in America and 160 drill holes in La India were completely relogged. This improved the volcanic stratigraphy and identified faults that probably controlled vein mineralisation. Our knowledge of historic mine voids was also improved. The relog was used to create wireframes for stratigraphy, structures and principal veins. The work generated several entirely new drill targets which now need testing. As part of a monitoring programme, Condor collected 61 samples from 47 active artisanal mines (29 from Mestiza, 14 from America and four sites at La India) (Figure 3). These are all shallow workings (< 30 m depth). 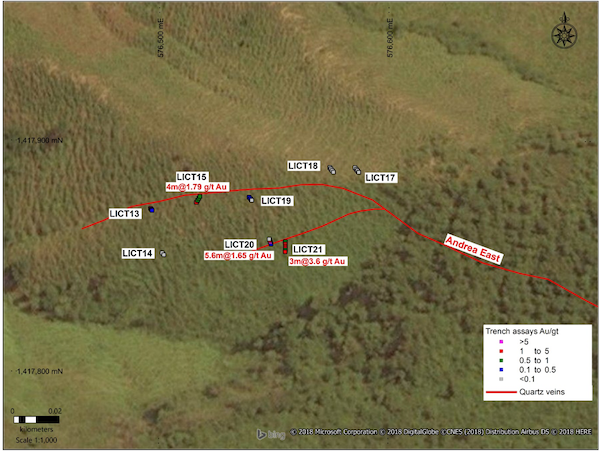 Average grades for samples at Mestiza is 14.2 g/t gold, with one sample from the Jicaro vein as high as 99.7 g /t gold. At America the average grade is 13.4 g/t gold; a sample of 47.6 g/t gold came from the Guapinol vein. Samples from the La India veins are not representative of the entire structure, as only four sites have been sampled to date. Link to Figure 3. Map of Mestiza and America veins with location of artisanal workings rock chip samples (yellow triangles) and results. Following successful drilling at Mestiza in 2017 (see RNS dated 6 November 2017), mapping and rock sampling continued to the northwest, along the Chorrera vein (Figure 1). Two new veins were discovered (see Figure 4). Trenching showed anomalous gold grades at surface but given strong elevation control on gold grade in epithermal veins, we still believe these merit drilling. Link to Figure 4. Map of Mestiza area with location of new trenches (yellow squares) and newly mapped veins. 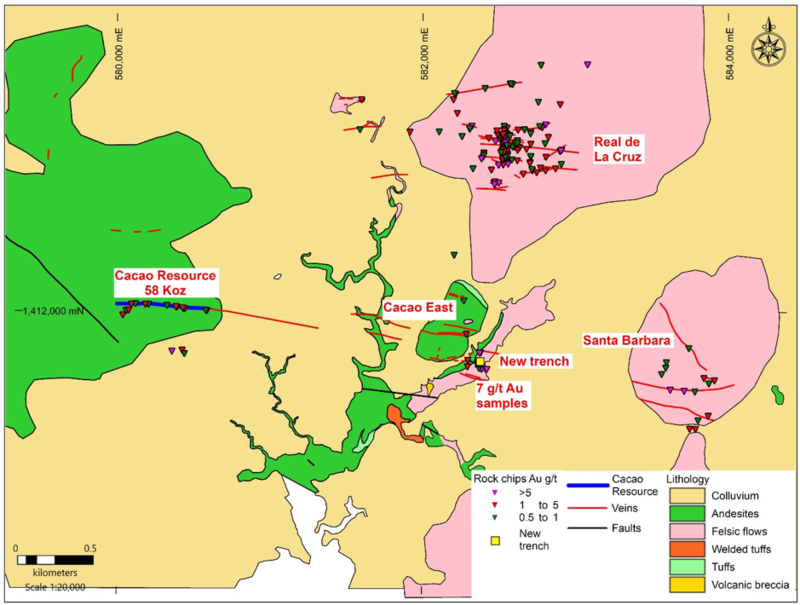 Following geological mapping and rock chip sampling in 2017 (see RNS dated 3 October 2017), a 5,000 m drill programme has been designed to increase the resource at Cacao and test its eastern extension. Scout drilling is planned at the Santa Barbara prospect, where surface samples are up to 5.9 g/t gold. One trench was cut into a 14 m wide exposure of sheeted narrow quartz veins (Figure 5). Results were disappointing but grab samples from the adjacent artisanal workings give 7.0 g/t gold. Link to Figure 5. Map of Cacao East and Santa Barbara drill targets with location of new trench (yellow squares) and historic rock chip samples. Follow-up work focused on detailed mapping and sampling to find the eastward continuation of the Andrea vein. 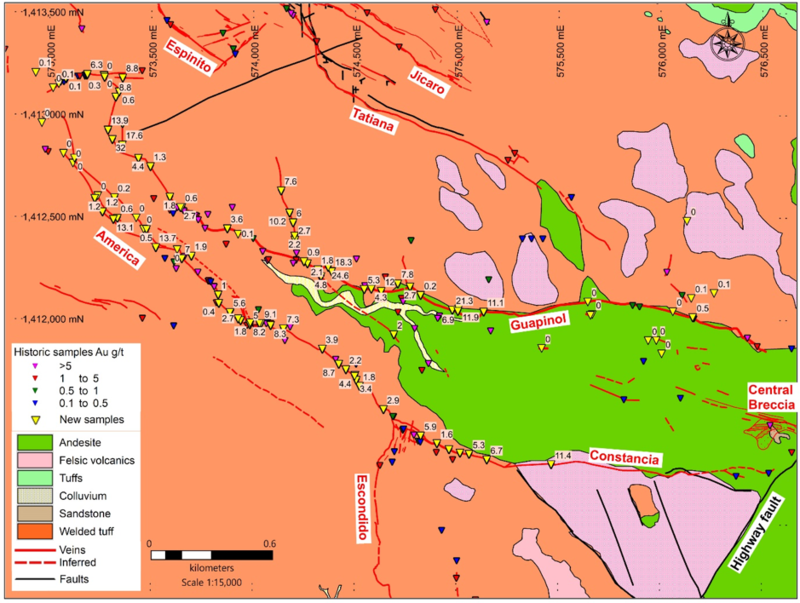 Short trenches in the easternmost exposures identified gold mineralisation (see RNS dated 3 October 2017). Rock chip sampling extended approximately 1.0 km to the southeast along a possible extension of the Andrea vein. Abundant low-grade quartz vein material in outcrops and float indicate possible extensive mineralisation at depth which will have to be followed up. 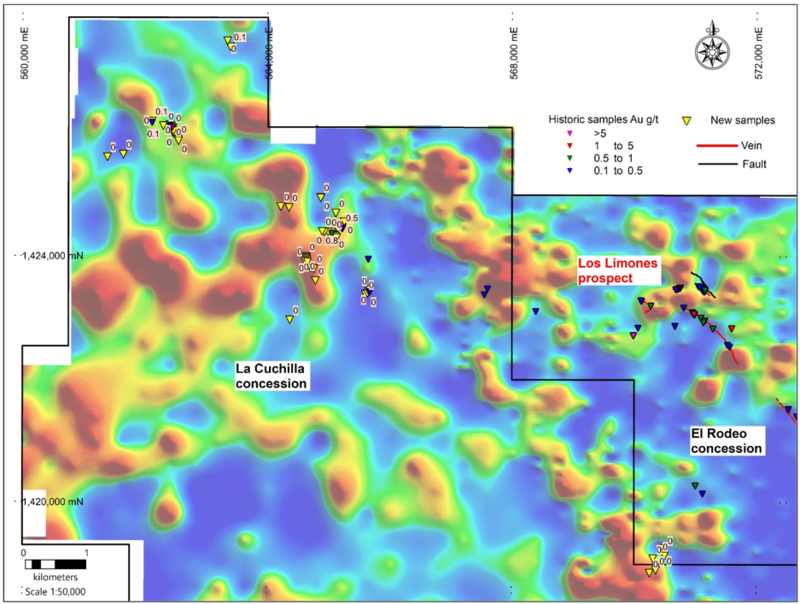 Additional sampling was done in the El Derrumbado area along a series of semi-parallel narrow east-west trending structures with grades up to 24.3 g/t gold (Figure 6). 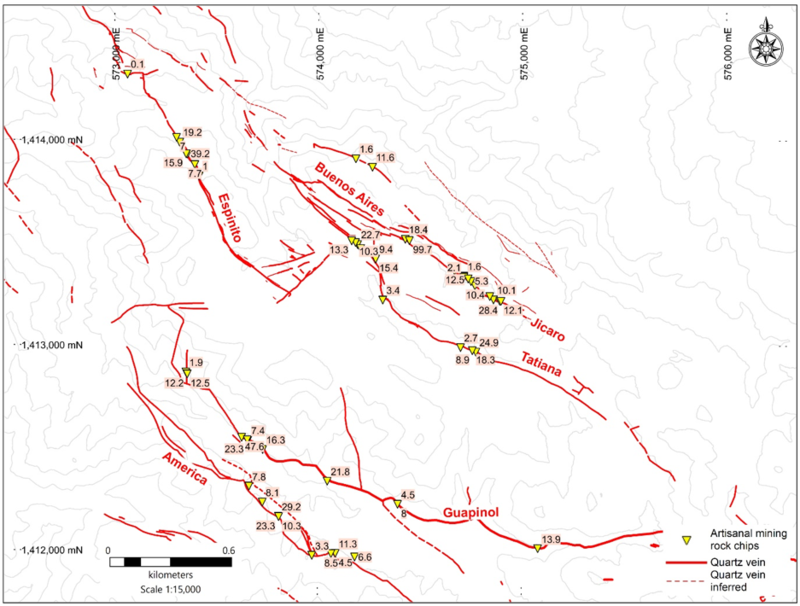 Trench sampling at eight sites along the Andrea East vein (Figure 7) demonstrated significant width and mineralisation. 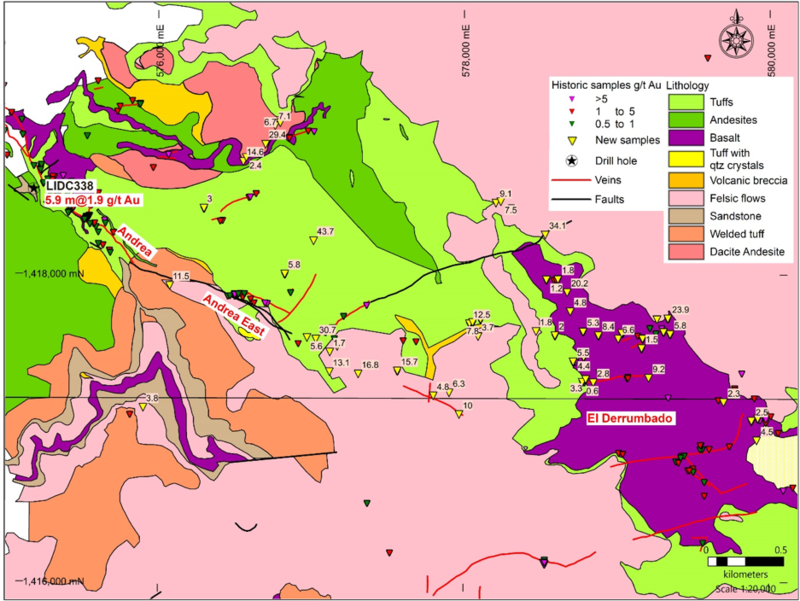 Best intercepts are: LICT15 (4.0 m @ 1.79 g/t gold), LICT20 (5.6 m @ 1.65 g/t gold) and LICT21 (3.0 m @ 3.6 g/t gold). There is also considerable evidence of mineralisation in the hanging wall to the main vein, which may make it a more attractive open pittable target in the long run. Drill targets have been selected and the Company are in negotiations with the landowner. Link to Figure 6. Map of Andrea East and El Derrumbado prospects with location of new rock chip samples (yellow triangles) and results. Link to Figure 7. Map of Andrea East with location of new trenches (yellow squares) with results and historic rock chip samples. The soil geochemistry survey (reported in RNS dated 1 August 2017) identified anomalous areas in the Tierra Blanca and La Cuchilla concessions, west of La India. 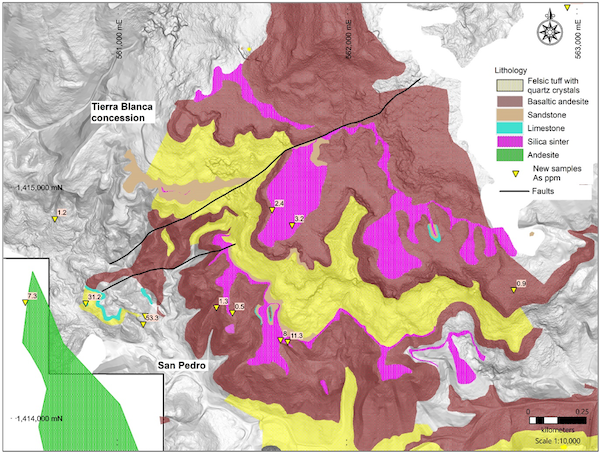 In La Cuchilla, elevated copper, molybdenum, arsenic (Figure 8), tellurium, titanium, silver soil anomalies were found in the northern part of the concession area along with linear radiogenic potassium anomalies along with magnetic lows. These areas were targeted for reconnaissance mapping and surface sampling. Rock chip samples taken during soil sampling in 2017 came back with anomalous gold values, including a 3.5 g/t gold sample found in the far northwest corner of the concession. Recent mapping and prospecting focused on these anomalies. Initial sampling of 47 rock chip samples from vein exposure and float mostly came back with < 0.1 g/t gold. However, four samples gave 0.1-1.0 g/t gold. This is still very early exploration, but these results and the amount of quartz vein material found on surface have begun to identify a north west-striking structure (Figure 9) that will be investigated further. Link to Figure 8. Map of the northern part of La Cuchilla concession with location of new samples (yellow triangles) with results and historic rock chip samples against a backdrop of Arsenic ("As") soil anomalies (reds are high As). Link to Figure 9. Location of rock chips with >0.1 g/t gold. Black arrow identifies new anomalous gold rock chips along a northwest striking trend in the northern part of La Cuchilla concession. The Tierra Blanca concession was granted by the government in 2015 (see RNS dated 26 June 2015). Condor geologists applied for the concession because it occupies a volcanic caldera that was probably intimately related to the La India epithermal veins. The caldera was occupied by a lake that eventually dried out, producing evaporites (gypsum) and freshwater limestones. Historical exploration in the area has been scarce to none. 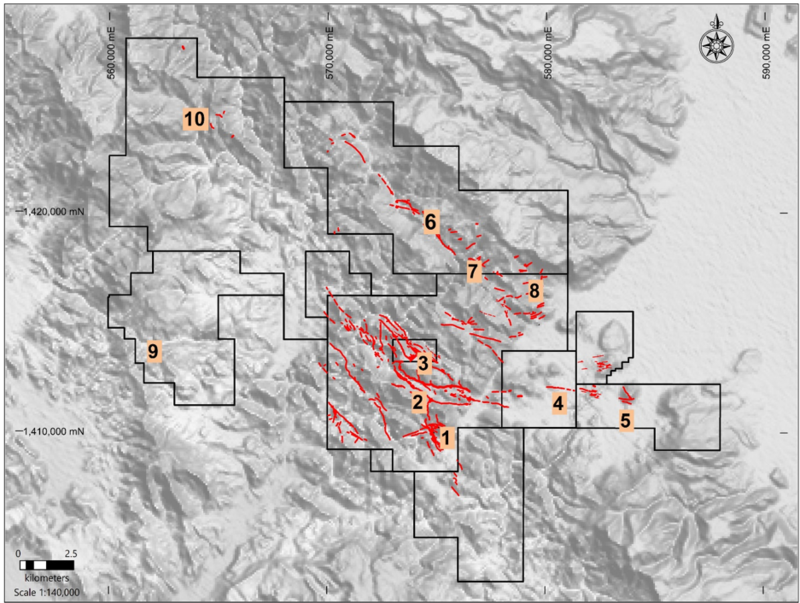 In the Tierra Blanca concession, anomalous copper, arsenic, titanium and local molybdenum in soil samples became the focus for mapping and prospecting (Figure 10). Exploration began in the southern part and quickly identified hot spring deposits ("sinters"). Close to San Pedro (Figure 11) there are several sinters interbedded with sub-horizontal pumice lapilli tuffs, basaltic andesite lavas and sandstones. These sinters include fossilised reeds, pisoliths and gastropods. The textures are identical to many other classic sinter deposits associated with precious metal mineralisation e.g. McLaughlin, California (c. 3.4 Moz gold) and Cerro Blanco, Guatemala. Sinters themselves generally have no valuable metal content, but they can indicate the proximity of epithermal veins. Link to Figure 10. Map of Tierra Blanca concession with location of new samples (yellow triangles) with gold ("Au") results and historic rock chip samples against a backdrop of arsenic ("As") soil anomalies (reds are high As). To date, results from surface samples of silica sinter, chalcedony and massive quartz float blocks have had grades of <0.1 g/t gold, but samples in the area just north of the San Pedro community have slightly elevated arsenic, compared to the surrounding samples. One sample obtained just outside of the concession boundary came back at 3.5 g/t gold. Work will continue to try and identify the source of the silica sinter. The information in this announcement that relates to the mineral potential, geology, exploration results and database are based on information compiled, and reviewed, by Dr Warren Pratt, Chartered Geologist (1994), Fellow of the Geological Society of London and Fellow of the Society of Economic Geologists. Dr Pratt is a geologist with over twenty years of experience in the exploration precious metal mineral resources. Dr Pratt consults to Condor Gold plc on an ad hoc basis and has considerable experience in epithermal mineralisation, the type of deposit under consideration, and enough experience in the type of activity that he is undertaking to qualify as a ‘Competent Person' as defined in the June 2009 Edition of the AIM Note for Mining and Oil & Gas Companies. Dr Pratt consents to the inclusion in the announcement of the matters based on their information in the form and context in which it appears and confirms that this information is accurate and not false or misleading. A ring-shaped depression caused by the collapse of an area of land at the centre of a volcanic complex caused by the emptying of the underlying magma chamber. Hydrothermal deposits formed at shallow depths below a boiling hot spring system are commonly referred to as epithermal, a term retained from an old system of classifying hydrothermal deposits based on the presumed temperature and depth of deposition. Evaporites are layered crystalline sedimentary rocks that form from brines generated in areas where the amount of water lost by evaporation exceeds the total amount of water from rainfall and influx via rivers and streams. Systematic collection of geophysical data to determine characteristics of underlying rocks and structures. A spring of naturally hot water, typically heated by subterranean volcanic activity. Hydrothermal deposits formed at shallow depths below a boiling hot spring system which are dominated by reduced, neutral-pH conditions. A small (mm-cm) rounded accretionary mass, usually of calcium carbonate or silica. Fragmental volcanic rocks composed solely or primarily of volcanic materials of different sizes. The process of collecting and analysing unconsolidated soil sediments to locate geochemical anomalies in the underlying rock and to use these to find ore bodies. Condor Gold plc was admitted to AIM on 31 May 2006. The Company is a gold exploration and development company with a focus on Central America. In August 2018, the Company announced that the Ministry of the Environment had granted the Company the Environmental Permit ("EP") for the development, construction and operation of a processing plant with capacity to process up to 2,800 tonnes per day at its wholly-owned La India gold project in Nicaragua ("La India Project"). The EP is considered to be the master permit for mining operations in Nicaragua. Condor published a Pre-Feasibility Study ("PFS") on La India Project in December 2014, as summarised in the Technical Report (as defined below). The PFS details an open pit gold mineral reserve in the Probable category of 6.9 million tonnes ("Mt") at 3.0 g/t gold for 675,000 oz gold, producing 80,000 oz gold per annum for seven years. La India Project contains a mineral resource in the indicated category of 9.6 Mt at 3.5 g/t for 1.08 million oz gold and a total mineral resource in the inferred category of 8.5 Mt at 4.5 g/t for 1.23 million oz gold. The indicated mineral resource is inclusive of the mineral reserve. Certain disclosure contained in this news release of a scientific or technical nature has been summarised or extracted from the technical report entitled "Technical Report on the La India Gold Project, Nicaragua, December 2014", dated November 13, 2017 with an effective date of December 21, 2014 (the "Technical Report"), prepared in accordance with NI 43-101. The Technical Report was prepared by or under the supervision of Tim Lucks, Principal Consultant (Geology & Project Management), Gabor Bacsfalusi, Principal Consultant (Mining), Benjamin Parsons, Principal Consultant (Resource Geology), each of SRK Consulting (UK) Limited, and Neil Lincoln of Lycopodium Minerals Canada Ltd., each of whom is an independent Qualified Person as such term is defined in NI 43-101. Dr. Warren Pratt (CGeol), Senior Geological Consultant to the Company and a Qualified Person as defined by NI 43-101, has approved the written disclosure in this press release. All statements in this press release, other than statements of historical fact, are ‘forward-looking information' with respect to the Company within the meaning of applicable securities laws, including statements with respect to: results of exploration activities, the mineral resources, mineral reserves and future production rates and plans at the La India Project. Forward-looking information is often, but not always, identified by the use of words such as: "seek", "anticipate", "plan", "continue", "strategies", "estimate", "expect", "project", "predict", "potential", "targeting", "intends", "believe", "potential", "could", "might", "will" and similar expressions. Forward-looking information is not a guarantee of future performance and is based upon a number of estimates and assumptions of management at the date the statements are made including, among others, assumptions regarding: future commodity prices and royalty regimes; availability of skilled labour; timing and amount of capital expenditures; future currency exchange and interest rates; the impact of increasing competition; general conditions in economic and financial markets; availability of drilling and related equipment; effects of regulation by governmental agencies; the receipt of required permits; royalty rates; future tax rates; future operating costs; availability of future sources of funding; ability to obtain financing and assumptions underlying estimates related to adjusted funds from operations. Many assumptions are based on factors and events that are not within the control of the Company and there is no assurance they will prove to be correct. For more information visit www.condorgold.com.